Downtown San Diego has undergone a transformation this weekend as it braces for Comic-Con International 2012. Fans of science fiction and fantasy comics, books, movies and television have all invaded San Diego’s Gaslamp Quarter for the annual event that takes place at the San Diego Convention Center. Comic-Con’s preview night officially began at 6:00 pm on Wednesday, July 11th 2012, but the crowds of people in San Diego’s bustling downtown district were there early. The event officially runs from Thursday until Sunday, and over 140,000 guests are expected to arrive in San Diego from all over the world. Comic-Con was founded in 1970 as the “Golden State Comic Book Convention” by a group of San Diego residents. 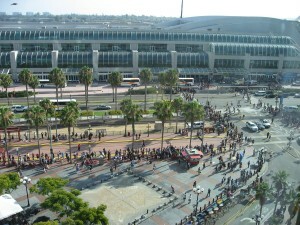 Comic-Con is the largest convention in both North and South America, and the fourth largest convention in the world. It’s hard to escape Comic-Con if you live in San Diego. Businesses and real estate all across the city have special Comic-Con ads and posters commemorating movies, television shows and more. Many local hotels, restaurants and other businesses are offering Comic-Con deals and specials to accommodate the yearly influx of visitors. The convention has an enormous economic impact on San Diego, with attendees spending millions of dollars in San Diego. If you have a home in San Diego and are not planning on attending Comic-Con, it’s probably a good idea to try to stay out of the downtown area this weekend. Parking and traffic in downtown San Diego, especially near the San Diego Convention Center, where Comic-Con is held, will be especially hectic. The San Diego Trolley is holding special Comic-Con service that will take Comic-Con attendees to the Convention Center or Gaslamp Quarter stations. Some of the highlights for this year’s Comic-Con include celebrating 100 years of Tarzan, 50 years of James Bond and 20 years of the Power Rangers. There will also be sneak peeks of upcoming films, including The Hobbit, Iron Man 3 and The Expendables 2. Comic-Con is a great San Diego event, and even though passes to the festival are sold out, there are a number of other activities going on in San Diego that are related to Comic-Con. The entertainment and excitement going on in San Diego this weekend can be fun for the whole family.